Herbivore Botanicals is one of our favorite natural and cruelty-free skincare brands for two reasons: The first is that we can trust that the ingredients are safe and effective. Each product is rich in natural botanicals and extracts that nourish, soothe, and treat our skin. (One of our favorites is the Lapis Facial Oil, $26. It's a clarifying oil that reduces redness and calms inflammation.) The second reason we love Herbivore Botanicals is that each of its products is housed in sleek packaging that's perfect for showing off on our vanities. Doesn't nice packaging just make skincare seem more luxurious? We think so. Well, the brand is at it again. Today it launched a brand-new moisturizer that's inspired by Hawaiian skies at sunset. It promises to soothe, hydrate, and plump the skin all the while sitting in a gorgeous Millennial Pink glass jar. 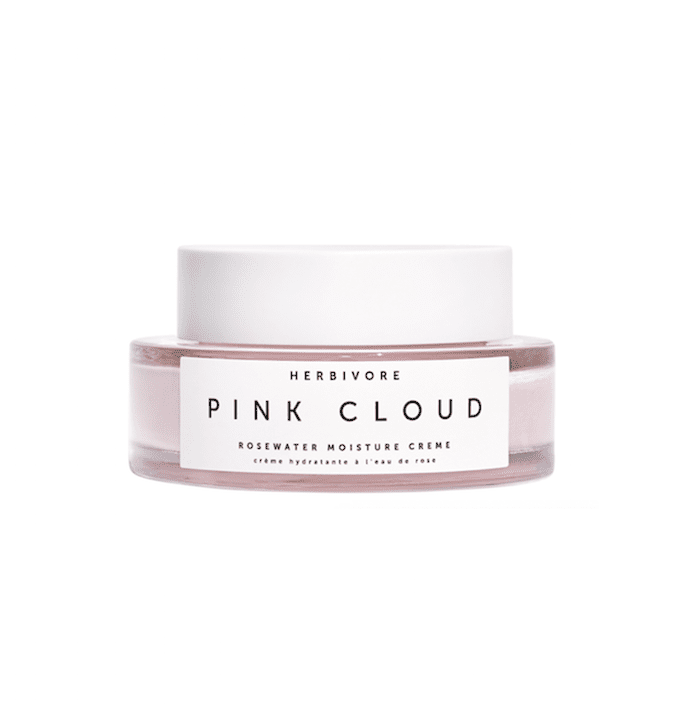 Keep scrolling to see Herbivore's New Pink Cloud Moisturizer. This product comes after the company received hundreds of requests for a cream moisturizer. It's 100% natural and synthetic-free, and as the brand puts it, let's your skin "relax (and breathe)." Rosewater is the main ingredient. It hydrates the skin and is potent in antioxidants to reduce the appearance of redness. It's also where the natural scent of the moisturizer stems from. Next is aloe water, which is super soothing. Plus it has natural salicylic acid to prevent blemishes. There's also youth-preserving white tea extract, balancing kukui oil, and brightening rice extract. Since all of these ingredients are lightweight, the end result is far from being greasy or sticky. Instead, the brand promises it's an exceedingly light moisturizer that all but sinks into the skin. We're hooked on trying this already since it sounds absolutely amazing. As a bonus, packaging is on point, as always, and the shade of the moisturizer is that Millennial Pink color we all know and love. (Oh, and if you're wondering where the color comes from, it's all thanks to eggplant extract. Again, there are zero synthetic ingredients.) When we get our hands on a jar of this moisturizer, we'll pair it with the new Herbivore rose quartz facial massage roller for a chic pink-themed skincare routine. This Pink Cloud Moisturizer is currently available on the brand's website. Come December 21, it will also be available at Sephora. Next, see all of our favorite products that are discounted as a part of Sephora's pre-holiday sale.